The new device is a smart necklace that’s designed to look like a sleek fashion accessory, but will house a tiny projector. If Google Glass were a set of night vision goggles into the world of your data, the smart necklace would be a flashlight, shining your data through its beam onto any nearby surface. Holding up your hand, you will theoretically be able to read emails and texts. Allowing the image to strike the ground before you, larger images like walking directions can be displayed. There’s even a plan to allow site-specific ads and content to pop up on the floor before you via the projector. Waving your hand before the image would “unlock” this sort of content, while a different swing of your arm can shut down the projected image entirely. The project is still very much under development. A single projector would have to adjust its focal length nearly instantaneously to allow images to be projected both on the floor and on your hand. The swaying of the necklace itself would have to be eliminated to keep those emails legible. 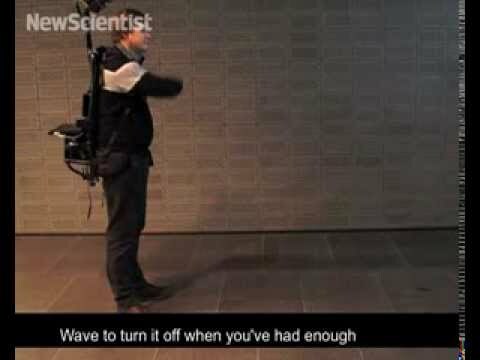 A prototype model, the size of a backpack, will go on show at Toronto’s annual computer-human interaction conference this April. Even if this sort of device can be miniaturized and made attractive enough for you to throw it around your neck, we wonder if many folks out there would resign themselves to being lead around by a flashlight of their personal data.